EMAPS » Vulnerability, Resilience and Conflict: Mapping Climate Change, Reading Cli-fi. Figure 1. Screenshot from presentation slides. Stills images from films, magazines and artworks that represents the future after climate change as frozen. 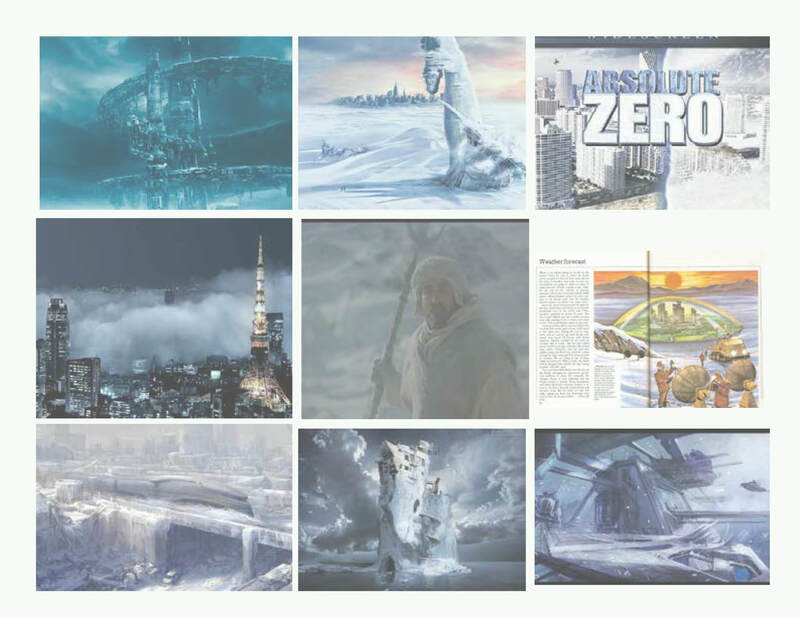 Left to right: The Colony (2013), The Day After Tomorrow (2004), Absolute Zero (2006), Arctic Blast (2010), Quintet (1979) , Fact or Fantasy (World of Tomorrow), Snowpiercer (2013), Ice Age Future (2007) and Ice Age Premonition. During the following days researchers from the Digital Methods Initiative, designers from DensityDesign Lab at the Politecnico di Milano and former students of the New Media MA from the University of Amsterdam focused on three projects. The first one, “Mapping climate conflict vulnerability and victims”, identified the most vulnerable and resilient countries using three vulnerability indexes (DARA’s CVM, GAIN index and Germanwatch’s CRI). Afghanistan, Angola, Cambodia, Laos, Madagascar, Mauritania, Myanmar and Niger are according to this method the most vulnerable countries. The least vulnerable are Cyprus, Egypt, Iceland, Israel and Luxembourg. Afterwards, a profile was created for these countries in terms of their associated issues. These profiles demonstrate that the countries resonate most within the sub-issue space of infrastructure and human habitat. “Food” and “water” were also shared across countries, while “health” seems to be specific to Afghanistan and Israel, and “ecosystem” to Iceland only. Afterwards, the analysis turned to the online spaces themselves (namely, Google, Google News, Twitter and a set of UN documents), and how each country and their respective issues resonate in them. Figure 2. 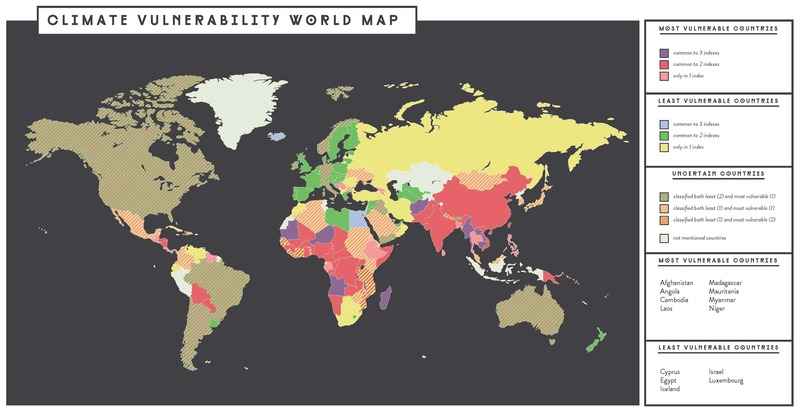 Climate Vulnerability World Map . The most vulnerable countries (in purple, occurring in all three lists) are located either in Africa or Asia. Very vulnerable countries (in red, occurring in either two of the lists) are also located in the same regions, mostly West African and Southern Asia. Other vulnerable countries (in pink, appearing in at least one list) are more spread out: from South America through Central Europe to Southern Asia. The final layer of the project is dedicated to the aesthetics of climate change as accessed through Google Image search. The most dominant subset of climate change related images according to Google are landscapes, science and people. The most prominent subcategory within the landscapes was imagery related to disasters, followed by land and sea (floating icebergs). The second project was “Climate conflict and the U.N. agenda”. Here, the starting point for the enquiry is to ascertain the extent to which the link between climate change and conflict is recognised on the U.N.’s agenda. Particularly, the study takes an inverted approach, assessing whether conflict is regarded as a climate change issue, as well as whether climate change counts as a conflict issue. Using the directory published online by the U.N., two lists of organizations are assembled: one working with the issue of climate change and one working with peace and security, in which conflict is a sub-issue. Afterwards, a set of queries were performed to test the resonance of the issue of climate in the websites of the organizations working with peace and security, on the one hand, and to test the resonance of the issue of conflict in the websites of those actors working on climate change. Preliminary findings describe (climate) conflict as the top issue (on the U.N. climate change agenda, as defined by this method), however much it is not officially recognized as such. In the second part of this study, a larger U.N. issue space was examined, one comprised of a collection of U.N.’s official documents that mention climate change and/or global warming from the General Assembly (amounting to 1622 PDFs, 1987-2013), in which the terms scepticism, mitigation, adaptation and conflict are queried. The findings mirror those of the first study, with ‘conflict’ resonating the most, followed by adaptation, mitigation and scepticism (which is by far the least significant). Adaptation and mitigation follow each other over time rather closely, spiking during the 62nd session (2006), whereas conflict has a rather different pattern of activity. On both the climate agenda as well as the conflict agenda, conflict is in ascendancy followed by adaptation and mitigation. Skepticism, or the science, seems to be no longer a U.N. climate related issue, if it ever were. Figure 3. Issue cloud. Distribution of resonance of climate change related issues on websites on “United Nations Partners on Climate Change,” 23 October 2013. Data source: un.org/climatechange. Output by Lippmannian Device, Digitalmethods.net. Figure 4. Source cloud Top organizations for the issue of conflict on websites on “United Nations Partners on Climate Change,” 23 October 2013. Data source: un.org/climatechange. Output by Lippmannian Device, Digitalmethods.net. The last project advanced is “Climate Fiction (Cli-Fi): Landscapes, Issues, and Personal Narratives”. This project explored fiction about climate change in order to understand and categorize fictional scenarios about the future, and the role of human actors in those scenarios. This project uses digital methods in conjunction with manual work to gather data from Amazon.com and Google Books in order to understand the current zeitgeist of climate change in fiction. First the different elements of these books and their conflicts are captured and used to revisualize the book covers in terms of their issues, including type of disaster, protagonists and landscape, with a poster as the outcome. Some of the most dominant issues include: scarcity of food, fuel and shelter; lack of clean water, poor sanitary conditions and virus-affecting crops and detrimental effects of pesticides on the environment and the cancellation of food exports. Figure 5. Book cover redesign according to issues. 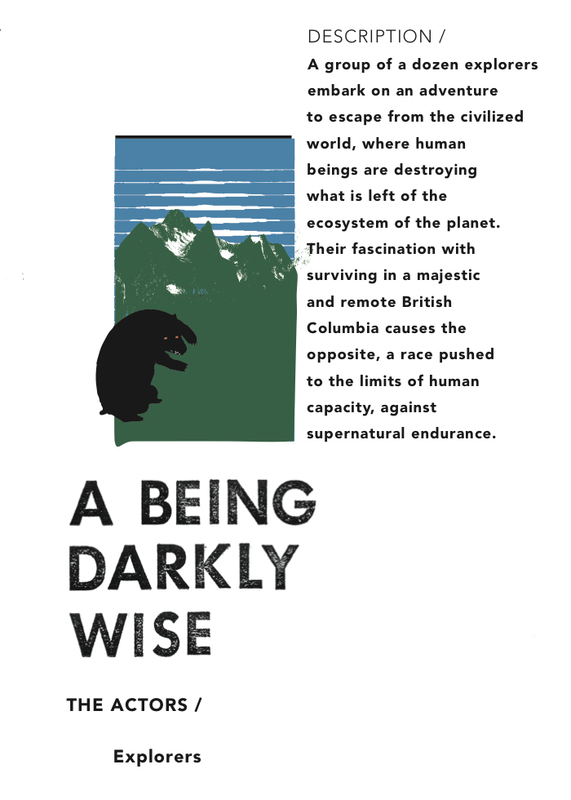 The cover of the book “A Darkly Wise” by John Atcheson (2008) is vizualized in terms of their scenario and associated issues. A second analysis using the tool ANTA was performed. The blurbs from 22 books are analysed and visualised as a network. Using this method what transverses this group of text are personal and human narratives (marriage, searching for loved one, returning home, love affairs) and the protagonists are characterized as husband, wife, lovers, friends, sons and daughters. A final set of queries was done to inquire into how people in these future scenarios remember the climate past. The time when fuel was widely available is remembered by those leaving in a post-oil world as a golden age. Characters describe the impossibility to emotionally relate with the architecture of the cities that are now underwater (and that they never knew). A post about the preliminary outcomes of this project will be published in the Amsterdam-based think tank Next Nature blog. We are pleased to share these preliminary sets of findings and look forward to collaborating during the upcoming sprints! This entry was posted by Amsterdam on Wednesday, December 11th, 2013 at 3:26 pm. It is filed under climate change, Events. You can follow any responses to this entry through the RSS 2.0 feed. You can leave a response, or trackback from your own site. © 2013 EMAPS | Powered by WordPress | Theme 'Sirup' by 1000ff | 36 queries 0.204 sec.